You are currently browsing the Western Custom blog archives for October, 2009. Happy Halloween Everyone! 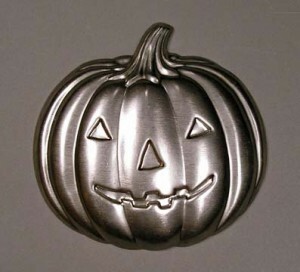 Decorative Metal Stamped Images are attractive, and make great additions when creating your seasonal craft projects. These are available in many different themes. Cowboys, Pine Trees, Moose, Deer, Eagles, Fairies, and the Good Ole American Flag are just some of the choices available. A handcrafted gift can be a much more personal expression of appreciation for those we love and cherish. Express your creativity this season; you are limited only by your imagination. With Autumn in the air, the leaves are turning color, temperatures are crisp, and Fall is definitely making its mark. Thoughts are now turning toward the holidays. Halloween is just around the corner, and Thanksgiving is now less than a month away. Table decorations and seasonal decor choices are abundant. 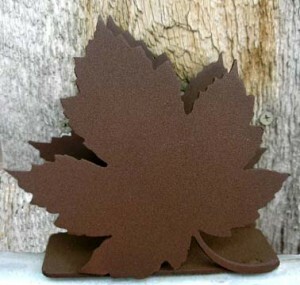 This Maple Leaf Napkin Holder is yet one example of a decorative, yet functional piece of decor, especially suited for the fall season.